Welcome to my three-part series on how to make pho! In this series I’m going to explore and share recipes for the three most popular types of Vietnamese pho. Today, we’ll look at the most popular version outside Vietnam, a Saigon-style pho. I’ll follow this up with a Haigon-style pho, and finally, a chicken pho. All three of these recipes will be made in the traditional manner – slowly simmered on the stove top to develop some heart-stopping incredible flavor. So please put the Instant Pot away for now and forget about making a quick and easy pho recipe (also known as “faux pho”) of which there a kazillion online. Let’s learn to really make pho the way they make it in Vietnam. Now to be totally straightforward here, I’ve never been to Vietnam, though it’s certainly high up on my list of countries to travel to. Much of what I’ll be writing about I learned through The Pho Coobook, by Andrea Nguyen. 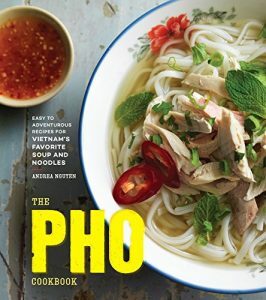 If you really want to learn to make pho at home, this is an awesome resource. Nguyen, a native of Vietnam, will teach you about the history of pho, how it evolved and changed and how it continues to evolve and change around the globe. And of course, she’ll show you how to make pho in a variety of different and delicious ways. I’ll be making all three of the old school stunners in this series starting with the Saigon-style pho. It’s the southern Vietnamese version of pho that came out of Saigon and the one that almost every Vietnamese restaurant in America serves. Of course, it’s popular for a reason. It is so friggin’ pho-king good it almost hurts (and because you can’t write a post on pho with saying “pho-king”). 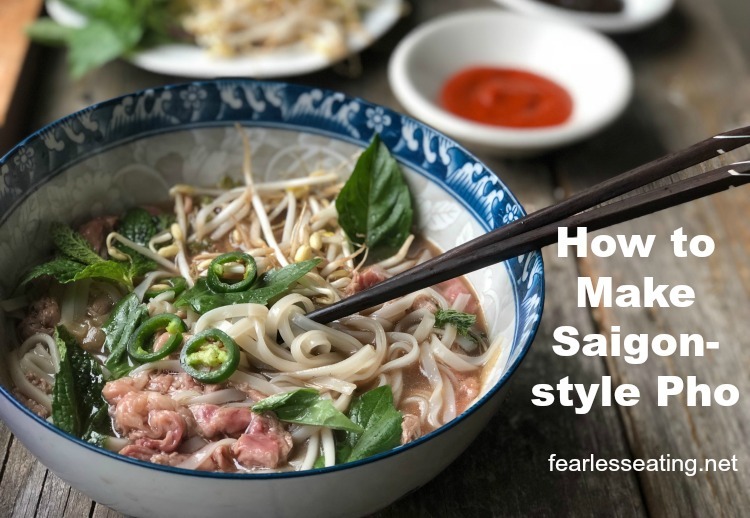 The three defining features of Saigon-style are its semi-sweet broth, the liberal use of garnishes (herbs and bean sprouts) and the use of hoisin and a chili sauce (often sriracha) for seasoning. It’s become so standardized in America that most people don’t know any other type of pho. And that’s OK. Familiarity is a good thing when you’re first learning a recipe! It all comes down to the beef broth. Sure you can use beef broth from a box, add a few spices, simmer it for a little while and then season it with fish sauce, hoisin sauce and sriracha and call it “pho” (though it’s really faux pho). But it won’t taste magical. 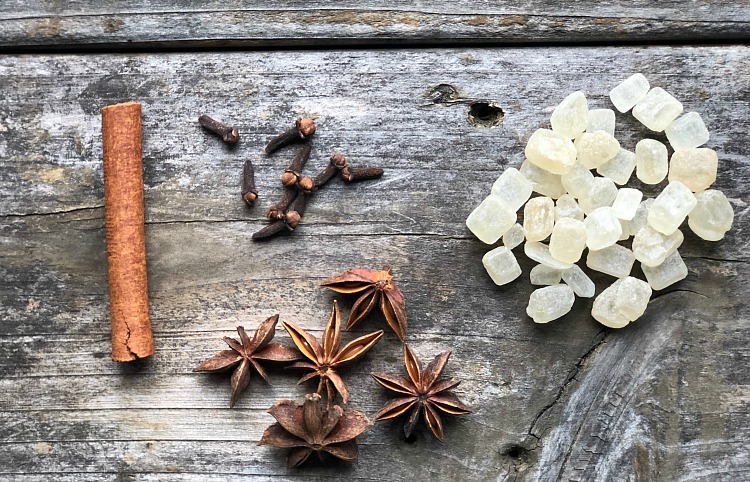 To make pho in a way that will make time stand still, you really need to make your own beef broth from scratch with all the aromatics and spices. The following 8 steps will teach you how to make pho from start to finish. But it’s the first four steps where the magic happens. Follow them as closely as possible and I promise you’ll have made the best pho-king (I can’t help myself) pot of pho you’ve ever tasted in your life. 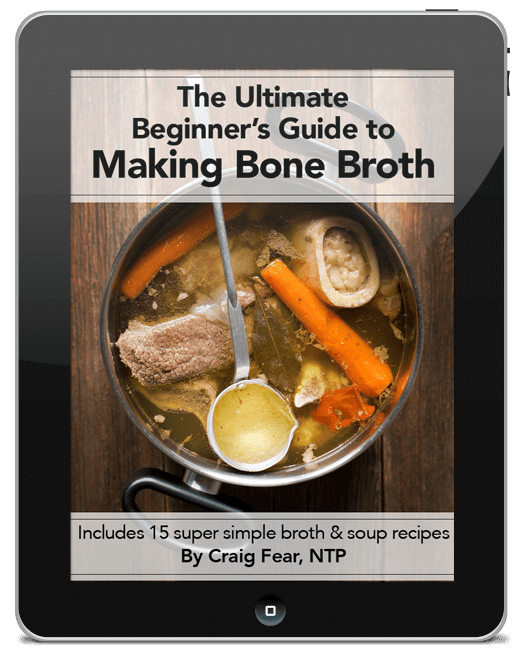 Ty to use a variety of beef bones such as marrow, neck and knuckle bones. Each one adds slightly different tastes and textures to the broth giving it more depth and complexity. For example, neck bones add meaty flavor, marrow bones adds good nutrients and knuckle bones add body. You could also use a beef oxtail if you can find one. Get about six to seven pounds of beef bones, add them to your stock pot, add filtered water to cover (about 6-7 quarts) and bring the water to a boil. Skim off any scum that rises to the surface and reduce the heat to a gentle, slow simmer. Cover and keep the broth gently simmering for four to six hours. The next step is one that almost all faux pho recipes skip but is essential for creating that magical tasting pho broth. Charring ginger and onion cooks them slightly which converts their sugars and adds a slight sweetness. It also enhances their aromatic quality which makes the broth that much more delicious. There’s a few ways to do this depending on your stove top situation. First, cut one unpeeled white or yellow onion in half. You can also use one or two large shallots in place of an onion. Next, take about a four inch piece of unpeeled ginger and slice in half lengthwise. The best way to char them is via a grill. 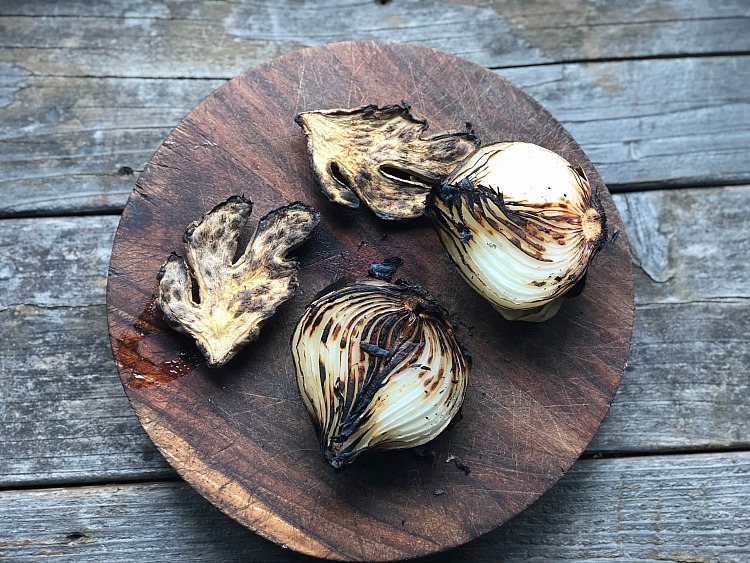 Simply add them to a moderately hot grill, turning every so often until they’re slightly blackened but not charred to a crisp. The next best option is to use a gas stove. Put a grate of some sort over the burner and char them the same way as if you’re grilling them. Make sure to put the stove fan on for this. The last option, which is the option I used, is to char them in the stove by broiling them. This option will take a little longer and the onions will likely char faster than the ginger. Watch it closely, turn on occasion and remove from the oven after about 10-15 minutes. Once charred, remove from the heat for a few minutes to let them cool. Then remove the outer skin from the onion and peel the ginger. Remove any blackened pieces and add the ginger and onion to the beef broth. If you can’t find rock sugar locally, this is a good brand on Amazon. That would be 1 cinnamon stick, about 4-5 star anise, 5-6 cloves and a 1/2 ounce (about 3 teaspoons) of the rock sugar. Add them to the beef broth and simmer for the full 4-6 hours. When the broth is almost done simmering, add about 1/4 cup (about 4 tablespoons) of fish sauce. Go slow here. Start with 2 tablespoons, taste and add more as needed. Nguyen recommends also adding sea salt to the broth but I would caution against that. Different types of fish sauce are saltier than others. Trust me, there’s no one that loves salty more than me but there’s nothing worse than oversalting your broth, especially after you’ve spend hours making it. Stick with the fish sauce, add it slowly, taste until you can’t help blurting out…you know what I’m going to say… here it comes… PHO-KING MAGIC! 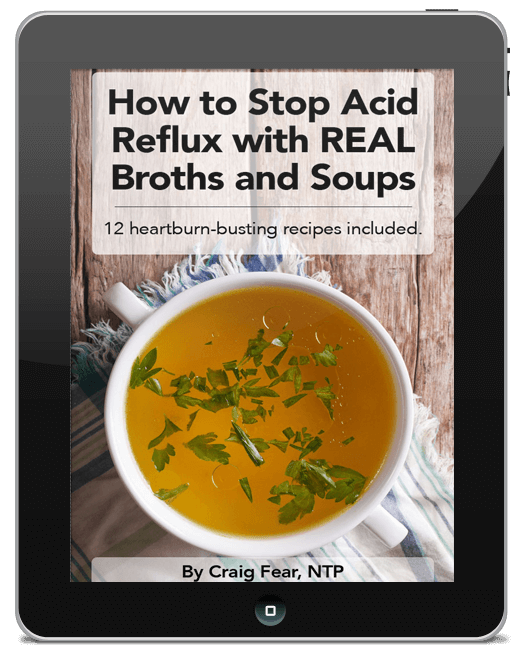 When you’re happy with the taste and done blurting out expletives, let the broth cool at room temperature for about 30 minutes and then strain the broth. The rest comes together quickly and easily. I got pretty lucky here. My wonderful meat CSA included shaved beef this month so I didn’t have to slice it. That was actually what inspired me to write this series. I knew immediately I would be making A LOT of pho. You can use any cut of beef but sirloin and NY strip are good cuts for flavor and slicing thin. Also, there may be some good pieces of beef on the bones too. Nguyen recommends removing the bones after about an hour and a half of simmering, trimming off any meaty pieces, and then returning the bones to the broth. 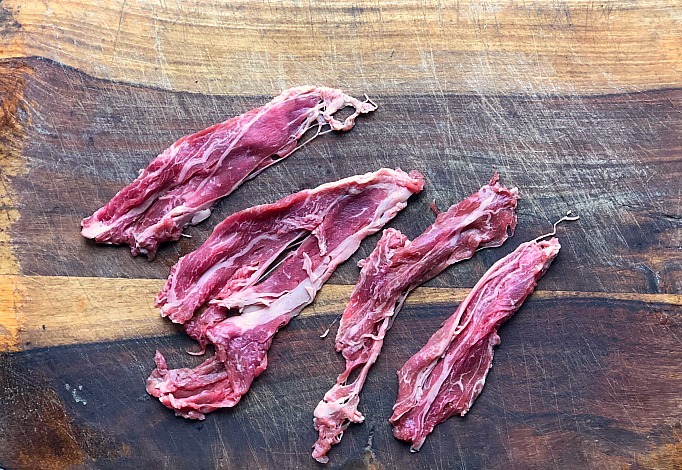 This is why you will often find different cuts of beef in traditional preparations of pho. Step 6. Make the rice noodles. Just before the broth is finished, make your rice noodles. Try to find standard medium-sized flat rice noodles (which look like fettucini). Most health food stores now carry them in dried form. I often see brands from both Thailand and Vietnam. Here’s the brand I used. Step 7. Get your herbs and sprouts ready. 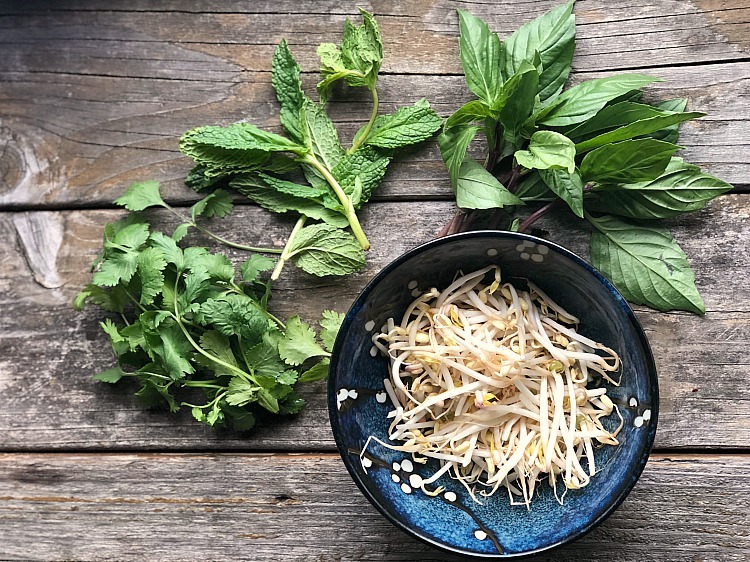 To make pho in the Saigon-style way, that means the classic herb trifecta of cilantro, Thai basil and mint as well as bean sprouts…. These three herbs add such great flavor! You can use just one if you like but I love using all three. Thai basil may hard to find outside Asian supermarkets. But don’t substitute regular basil! Just mint and cilantro are fine to use. Now if you’re among those who hate cilantro and thinks it tastes like soap, you might try culantro instead. 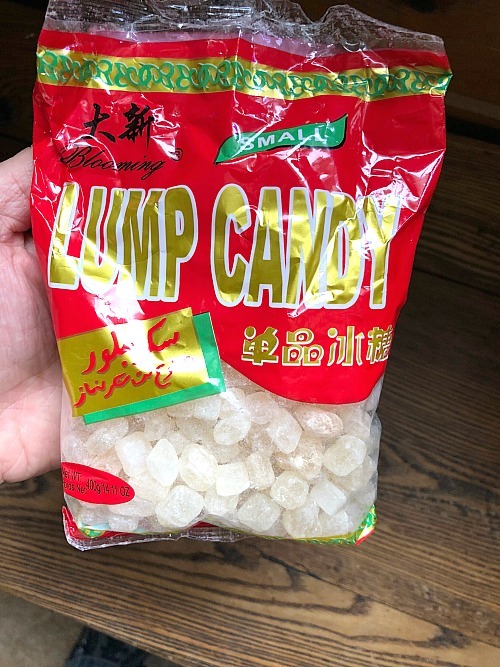 Yes, that’s culantro with a “u.” And yes, you’ll definitely need an Asian market to find this. 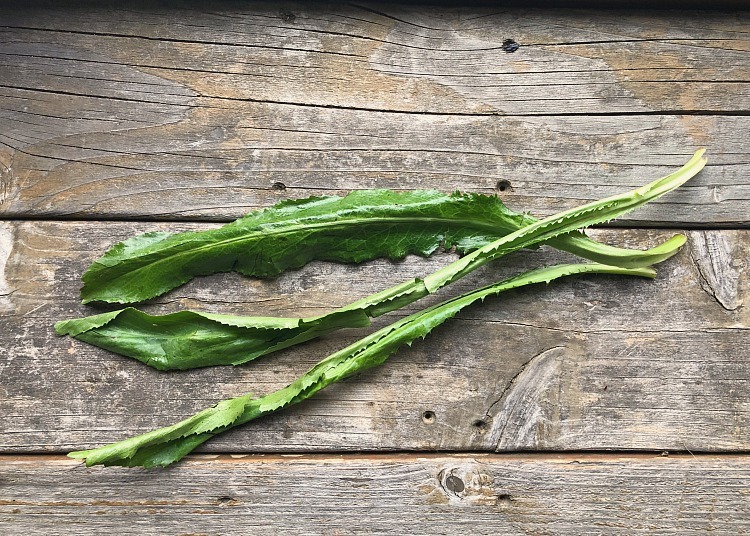 Here’s a good article on the difference between cilantro and culantro. I LOVE using culantro in pho. Although some say it’s similar in flavor to cilantro, I don’t think so. It has a more herbal flavor to me. I guess it’s hard to describe. If you can find it, just try it! Now here’s where I’m going to sway a little bit from convention and give you a few recommendations based on my own experience. Step 8 Recommendation #1: Go easy! I’ve learned the hard way. There’s nothing worse than going through all the above steps to make pho only to accidentally add way too much hoisin and sriracha. They can easily overpower the subtle flavors that took so much time to develop during the broth-making process. Just add a little bit at at time until you find what you like. There I said it. Of course, I”m talking about the Huy Fong brand pictured above, the most popular store-bought sriracha. I really don’t get this weird cultural phenomenon around it. People LOVE this stuff like it’s some sort of secret family recipe. I don’t know how it caught on but I find the taste a bit harsh and processed. And that’s the thing. It is highly processed. Have you looked at the ingredients? There’s some not-so-great things in there. Same for the hoisin sauce. Sorry to say but it’s not the best quality stuff out there either. So my recommendation here is two-fold. First, try the homemade recipes for hoisin sauce and chili sauce in The Pho Cookbook. Admittedly, I did not do this. But I can almost guarantee you’ll love how they taste. I say this because of my travels in Asia where it’s very common for the small family-run places to make their own condiments like chili sauces, vinegars and pastes. It’s also nice to experience some variety in your pho. In my opinion, Saigon-style pho suffers from a bit of a homogenized flavor due to the ubiquitious use of Huy Fong brand sriracha and Leek Kum Lee brand hoisin sauce. Now I realize very few people will make their own sriracha and hoisin sauce so the second part of my recommendation is to try to find some different store-bought brands. 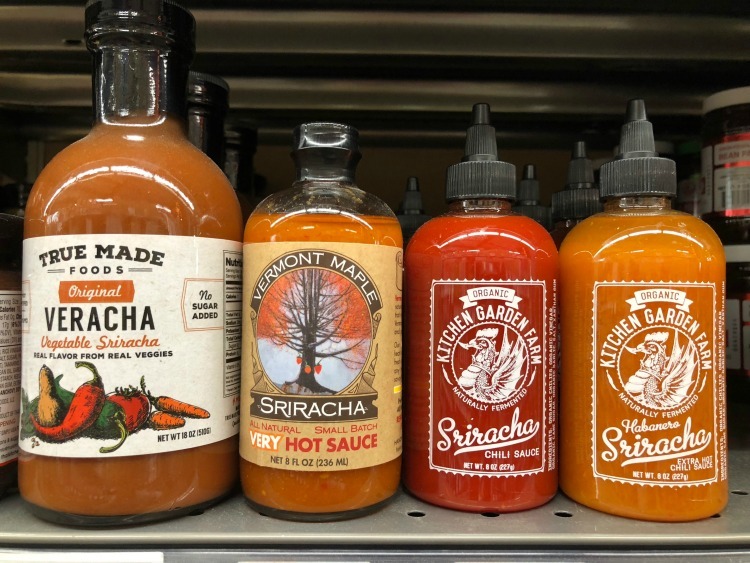 Sriracha is so trendy now that you’ll probably find a few artisan srirachas in your local health food stores. Here’s what I found in mine…. Good quality hoisin sauce is a lot harder to find. I’m not even aware of one. But if you know of a good quality brand please share in the comments below. Step 9. Put it all together. Place the rice noodles in individual serving bowls, followed by the raw beef and pour in the hot broth to cook the beef. Add the garnishes and seasonings, to taste. You now know how to make pho like a master. Finally, if you have any other insights or experiences, don’t hesitate to comment. I love learning from others. There’s so many different methods to make pho out there that I always enjoy hearing others twists, tips and tricks. Adapted from Andrea Nguyen’s recipe in The Pho Cookbook. This is the most popular version of pho in the West. It's slighty sweet and makes liberal use of herbs, bean sprouts and seasonings such as fish sauce, sriracha and hoisin sauce. Get about six to seven pounds of beef bones, add them to your stock pot, add filtered water to cover (about 6-7 quarts) and bring the water to a boil. Skim off any scum that rises to the surface and reduce the heat to a gentle, slow simmer. Cut one unpeeled white or yellow onion in half (or two large shallots). Slice unpeeled ginger in half lengthwise. Char ginger and onion on a grill, gas stovetop or by broiling in oven as described above and add to the broth. Add rock sugar, cinnamon, star anise and cloves to the broth. Cover and keep the broth gently simmering for four to six hours. When the broth is almost done simmering, add about 2 tablespoons of fish sauce and taste. Add more fish sauce, as needed, until the desired saltiness is achieved. About another 2 TBSPs is recommended. Thinly slice raw beef and set aside. Prepare rice noodles according to package directions. Place herbs and bean sprouts in bowls for individual garnishes. 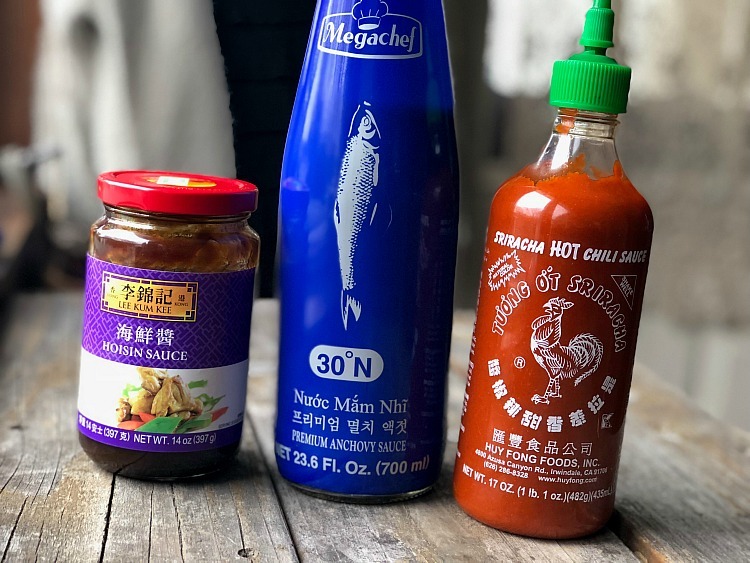 Prepare sriracha, hoisin sauce and fish sauce for individual use. Place rice noodles in individual bowls, place raw beef (or other types of beef) on top and ladle over with hot broth. Add garnishes and sauces, to taste.